This Crack Chicken Recipe using a pressure cooker is so delish. 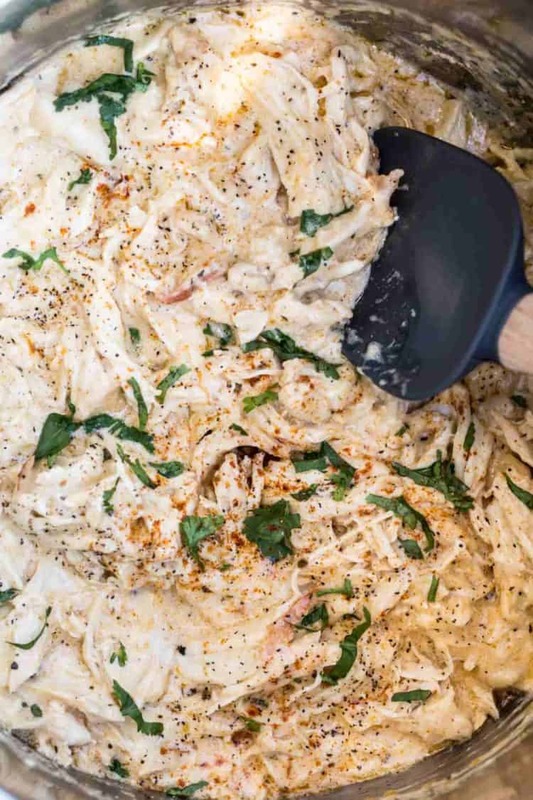 Chicken breast with cream cheese and seasonings, loaded with grated cheese and cooked in an instant pot.! 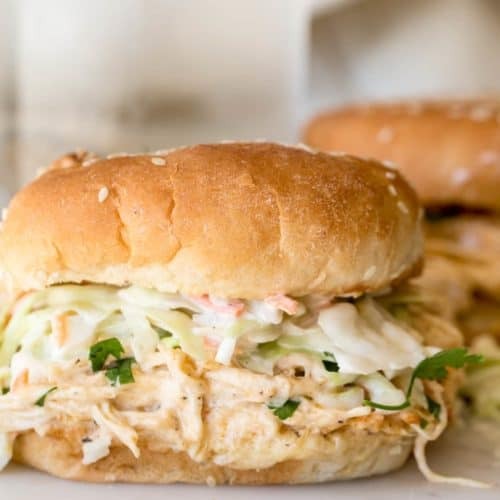 This chicken and our Slow Cooker BBQ Pulled Chicken are wonderful recipes for potlucks or lazy dinners that require minimal prep time! Crack Chicken isn’t the most appealing name for the recipe but it suits this recipe perfectly. The recipe gets its name for being SOO addictive. You just cannot stop eating it. Pull-apart tender chicken breast in a cheesy seasoned cream cheese mixture. Served with homemade coleslaw on a bun. This recipe is so easy to make that it’s almost too embarrassing to have a recipe for it! If you’ve not yet tried this. It’s PHENOMENAL! Grease instant pot with oil or butter. Add whole chicken breasts to pot. In a medium bowl, combine ingredients for the cream cheese. Spread the mixture over the chicken breasts. Cook chicken and release with a quick release of pressure. Add back to the instant pot, add the shredded cheese and mix everything with a spatula until well incorporated. Close the lid and allow the cheese to melt completely. 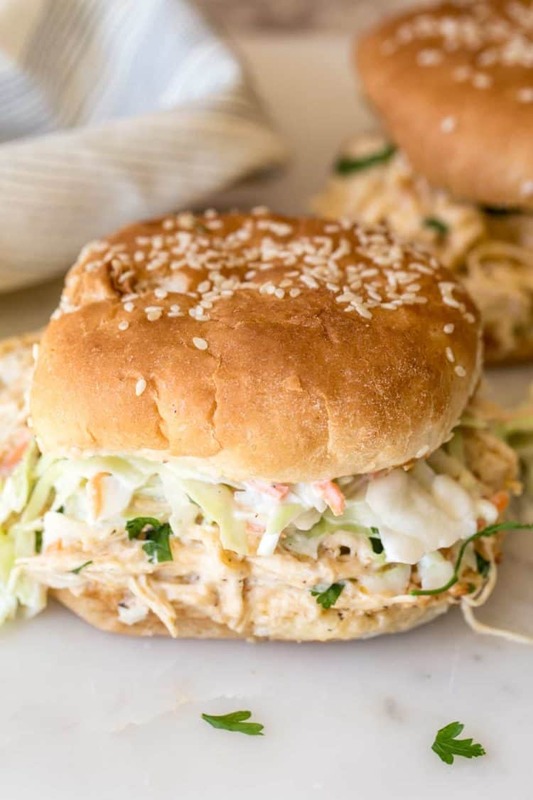 This amazing creamy chicken may be served as a sandwich with homemade coleslaw. It may also be served over mashed potatoes, or even as a side with buttered pasta. You may also have the chicken with tortillas, add lettuce and serve it as chicken tacos or quesadilla. Can Crack Chicken be frozen? Yes, this pull-apart chicken may be frozen. Keep it in an airtight container or freezer bag. Thaw and reheat on low heat in a saucepan to serve. How to Make Slow Cooker Crack Chicken? If anyone doesn’t have a pressure cooker and wants to use a slow cooker instead, here’s how to make slow cooker crack chicken. Prepare recipe per instruction and place into a slow cooker (Crock Pot). Cook on high 4 hours, cook on low 6-7 hours. Shred chicken with two forks. Add the grated cheese and mix well. Close slow cooker and continue cooking 15-30 minutes, or until cheese completely melts. An easy and quick recipe for Crack Chicken. Pull-apart chicken breast with cream cheese and seasonings, loaded with grated cheese and cooked in an instant pot. 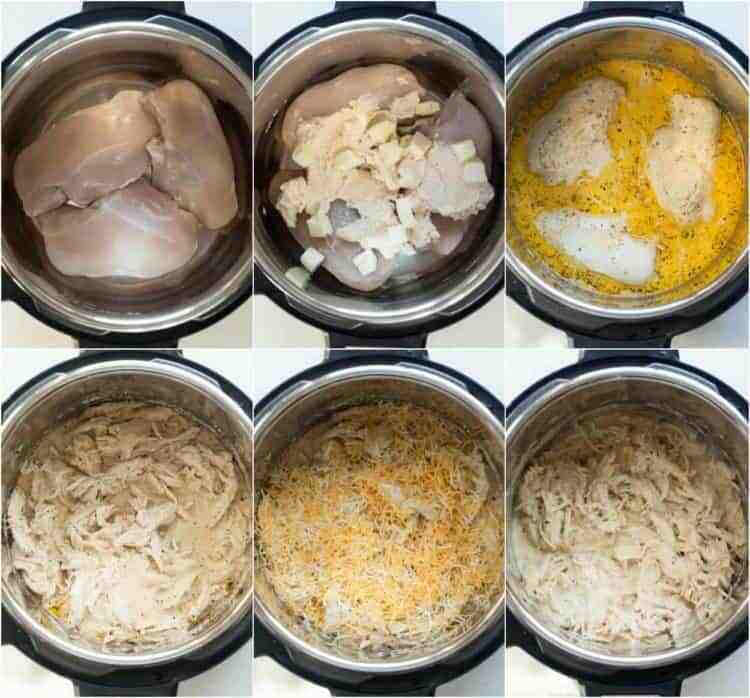 Place chicken breast into an instant pot. In a small bowl, combine all the ingredients for the cream cheese mixture. Spread the cream cheese mixture over the chicken breast. Add the cubed butter. Close lid and cook on high pressure for 20 minutes with a quick release of pressure. Add chicken back to instant pot, add shredded cheese and mix. Combine all the ingredients for the coleslaw. 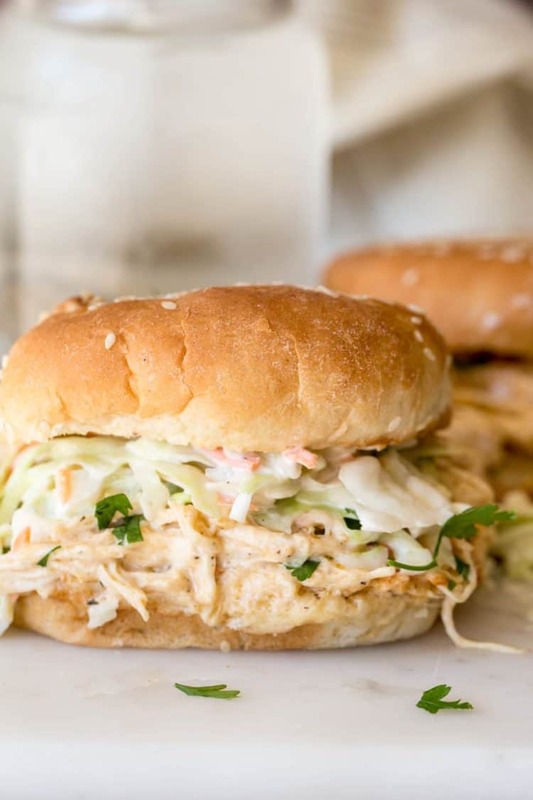 Add a generous portion of the pulled chicken onto a bun, top with coleslaw. Cheese: Colby Jack, Four Cheese, Mexican or a blend of Mozzarella and Mild Cheddar may be used. The Crack Chicken is so yummy!! We had it on a baked potato, and plan to serve leftovers on a bun with coleslaw. Just have to say the dry spices would also make a delicious rub on most any kind of meat, that’s going to be another adventure! That’s great, Donna. I love that you served chicken over a baked potato – that’s great. Jessica, we LOVE it in an instant pot. So quick and hassle-free but the chicken tastes just as amazing. 🙂 Let me know how you like it if you try it. Husband was disappointed I “just made a chicken sandwich “. Then he ate it and said to put it on my top 10. Creamy, flavorful and delicious! Upon review I found differences in your printer version and the description within the blog. The blog instructions state that the chicken needs to be laid in oil at the bottom of the pan. It also instructs the reader to naturally release the pressure. The printer version states that a quick release is needed. Do you have any suggestions on how to fix the issue? Do you not add any liquid to this recipe? It’s in the recipe card, 6 servings. Enjoy, Wendy! Can I use frozen chicken or it has to be thawed? Though I’ve not tried it, I wouldn’t advise frozen chicken. It will not cook evenly. Thawed chicken is best. Enjoy, Tanya! Have a most blessed 2019 year. I don’t use my instant pot that often but I’m for sure gonna have to pull it out to make this amazing, easy recipe! This crack chicken will be a great reason to get out the instant pot! 🙂 It’s soo good. Valentina I can’t wait to try this. Please share lots more recipes using a pressure cooker. I’ve had one for a couple years now and don’t know what to make in it. Thank you so much 🙂 also is there a substitution for oregano? I don’t have it and never use it. This recipe looks amazing! I don’t have an instant pot can I still make this but in a slow cooker instead? I had it written up, my pregnancy brain forgot to add it, haha. 🙂 Enjoy and hope to hear your feedback. Mmm Looks soooooo good!! Can I make it in a slow cooker?